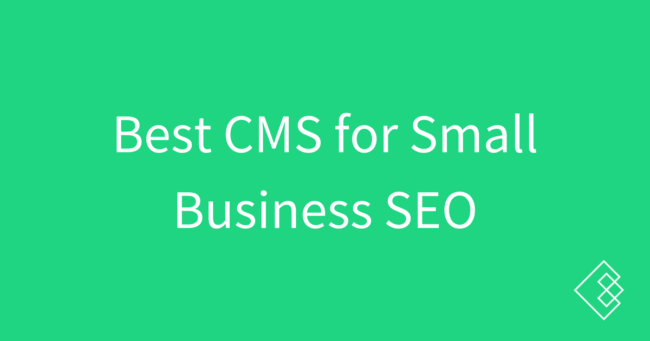 What’s the best CMS for small to medium size businesses to use for SEO? However, SEO is absolutely a consideration that you should take into account when building a new website. Whether you are building a personal website that you hope to make a side income from or a business site for a business that is already your main income (or your employer’s), you have to take SEO into account. Not mentioned is building your own CMS and site, which ultimately is the most extendable option as you can literally do anything you want with it. But because that is so outside the realm of possibility and beyond the needs for 99.9% of people, it will not be covered today. WordPress powers 28% of the internet as of early 2017. Split between WordPress.com (the fully hosted version) and WordPress.org (the self-hosted version), WordPress is the CMS market leader for small businesses and large publishing platforms alike. If you’re a very large business (like a TechCrunch), there is also WordPress VIP. So why WordPress for SEO? There are a few reasons. WordPress is fantastic for SEO for the large majority of websites simply because most websites and business needs are not very complicated. You need the ability to adjust title tags, make SEO-friendly URLs (with hyphens instead of dashes or URL parameters like site.com?p=1234). Those things in and of themselves will get a small business started off on the right foot. WordPress is open source, meaning they consistently push out updates to the codebase to keep it (more) modern and fixing bugs in a timely manner if the community wants to. WordPress.org is also written in WordPress’s version of PHP, which is an internet-standard accepted language that is also very SEO friendly. In many ways, it’s the easiest dynamic (allowing different pages to pull information from the database) code language to learn. Depending on the plugin and the way the functionality is loaded, they could cause you some SEO headaches. But by and large, they’re just fine for SEO when used in moderation. As referred to above, WordPress is endlessly extendable and modifiable. Out of the box fresh, you can basically make it do whatever you want and display whatever content you want wherever you want. While the last one above may be outside the skillset of most, the previous three are all easily done via the WordPress user interface if you know where to look. Need to add your businesses Name, Address, and Phone Number (NAP) to your site so you rank better in your city? Use a widget or put it in the footer. Have some high-volume keywords you are trying to rank for? You’re going to need links, but you can link here from your navigation. Need to display real estate listings for your real estate business? There are many plugins available. The one challenge with WordPress for many users is still its admin area, which is definitely not pretty and can be confusing and not well organized for beginners and power users alike. While WordPress has its quirks for certain advanced needs, by and large it is usable enough once you’ve learned where everything lives. And if you really hate the interface, you can always restyle the admin area. WordPress SEO score for small businesses: WordPress, if you know what you are doing, can be fantastic for SEO. It requires a bit of configuration, but there is a reason that 28% of the internet uses WordPress, plus there are endless SEO for WordPress tutorials on the internet to help you out. Probably your best choice if you are at all technical or have access to a developer. I’ve recently helped a number of local businesses get their websites started and doing basic optimization. These are small business owners, not marketers or developers. They need a functional good-looking website with a contact form and a bit of ability to write new pages and customize colors and themes. Squarespace is amazing for them. It’s easy to use, the admin area is clean and well-organized, and figuring out how to create new pages, add new elements to a page, and add images and other information is a breeze. Squarespace out of the box is also quite SEO friendly and maybe even moreso than WordPress. If you need to build a simple website for your business and never plan to change URLs, need to do redirects, or add a lot of custom functionality then it may be a good choice for you. Squarespace also outputs relatively clean code (often cleaner than WordPress because it’s not open source) and because it’s fully hosted (as in you do not need to buy separate hosting from Squarespace to run your website) Squarespace sites tend to be much faster to load than most WordPress sites. Their full list of what they do for SEO is here and it’s a great start for small business owners. While Squarespace works well out of the box for the majority of small business owners, there are some very real SEO drawbacks. This is a function of Squarespace being a fully hosted instead of open source. Lack of ability to extend it into whatever you want/need it to be. Credo would not work well on Squarespace, for example. But for the right business with simple needs (a 10 page site, basic information) it’s great. No redirects allowed. If you have multiple URLs targeting the same keywords and want to combine them all into one URL, as far as I know you are unable to do this with 301 redirects. Cannot specify a different canonical for a page. If you have one page that is similar to another but you need it around for some reason, you cannot tell the search engines that another page is a near-duplicate with the canonical tag. These are all very real SEO considerations. But as I said earlier, for many small businesses Squarespace is absolutely all they need. You can 301 redirect with Squarespace. It’s not the easiest to manage/maintain, but it’s totally possible. They have a support post on it here. I moved a friend from WordPress to Squarespace a couple months ago and updated all his blog post URLs, since the Squarespace URL structure is different than WordPress. Squarespace SEO score for small businesses: much less extendable and optimizable than WordPress, but it’s easier to use and out of the box works very well with less configuration than WordPress or Joomla. Great to consider if your needs are simple. Oh Joomla! (yes, it actually has the exclamation point in the brand name). I actually began my website building career in 2007 on Joomla. I remember first hearing about “search engine friendly URLs”, which in their speak at the time were simply called “SEF URLs” and setting them up was a total nightmare with installing packages and scripts and doing rewrites. But Joomla is cumbersome. If you think WordPress is hard to use, just wait until you try Joomla. To be fair I haven’t *really* used Joomla in a number of years but as I’ve poked around the internet and sought to figure out how it currently works for SEO, I have to say that I’ve not been impressed with it out of the box. There are however Joomla SEO websites that can help you or your web developer/administrator out if needed. One big upgrade they have made over the years is around permalinks. As I mentioned previously these used to be an absolute nightmare to set up, but they now work out of the box. Joomla also has numerous SEO extensions (roundup) that provide various functionality, but much like WordPress installing many extensions can slow down your site as well as potentially conflict with each other and cause bigger problems. Joomla is more extendable than Squarespace which means that you are more able to go in and edit your template files to improve your onpage SEO. No H1 on your page? No problem, you can add it. Joomla SEO score for small businesses: can do more than Squarespace, but cumbersome to use. You’ll need a professional. Probably don’t use. Ha. For small businesses, Drupal is way too powerful and cumbersome. Avoid. I should end this post by mentioning that no CMS is perfect for SEO out of the box, and depending on your business needs (local address-based business vs internet business) your site needs will change. The best thing you can do for SEO, regardless of your platform, is to learn the basics and get those right. Learn the most important ranking factors. Learn basic keyword research. Learn why links to your site matter and which ones to avoid (and get!). And ultimately, build the best site experience you can if you want to rank – make it fast, give the information your customers need, and then tell them about it on other sites. How does SEO actually work? Great subject. Well, let’s consider the small business has a decent amount of money to spend on hosting. #1WordPress it is so much more capable than it was five years ago I believe this trend will continue a number of developers that are constantly working on repressing comparison to other CMS platforms dwarf’s pretty much everyone else. There really aren’t any other platforms that are able to do full enterprise like WordPress VIP as well as your first website. For $200 a month you get hosting phone support and some pretty good search engine optimization Help/info If you’re a do-it-yourselfer. “The Complete Solution for Content Marketers and Internet Entrepreneurs” ( powered by copy blogger it offers a very simple no coding solution or a PCI compliant high-end website. It is much easier to use since updating to Drupal 8 and has an extremely well-written backend. Once again you must pay for hosting yourself and in my opinion, WordPress is right choice 9/10 times in this scenario. Joomla is a platform I have only performed search engine optimization on I have never had to dig deep into the code, however, I have heard good things but would default back to WordPress. Excellent post. I agree that WordPress will be number one or a long long time and if you look at builtwith statistics it’s not going away anytime soon.